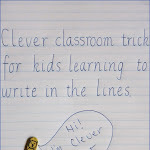 Here are 2 simple games for children to help practice Letter Recognition and Handwriting. 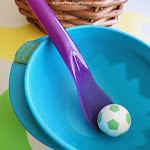 Adding the sensory element of salt and presenting it as "game" gives this basic and necessary skill practice a different dimension and that fun and interest level that entices children to want to have a go! Ideas to keep kids Active! Gross Motor and Movement Fun. Ideas to keep kids Active. where we featured "8 Activities using materials from the Recycle Bin"
The following posts all include ideas and activities that will encourage your child to move and get active. The different activities lend themselves to different environments and allow children to practice various gross motor skills, coordination and other developmental areas. With both a toddler and a preschooler in the house, it can be difficult finding collaborative activities for them both that doesn't result in my 4 year old declaring that her 18 month old brother is "wrecking everything!" They both love to paint though and when the experience is more about the process than the product, I find they are both able to have a great time creating and learning together. Today we had some simple explorative painting and printing fun with plastic food. 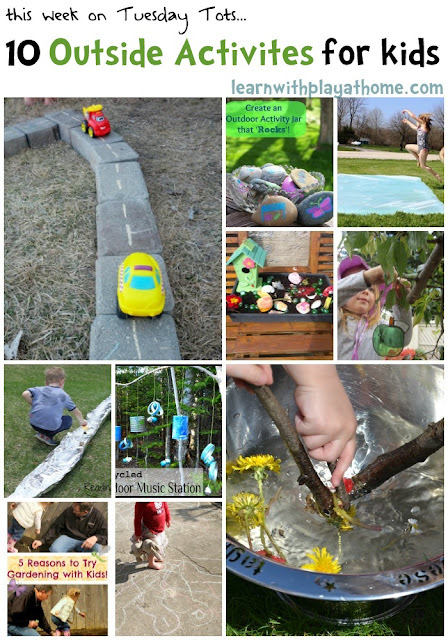 where we featured "10 Outside Activities for Kids"
When searching for materials to use with children, the recycle bin is a great place to start. 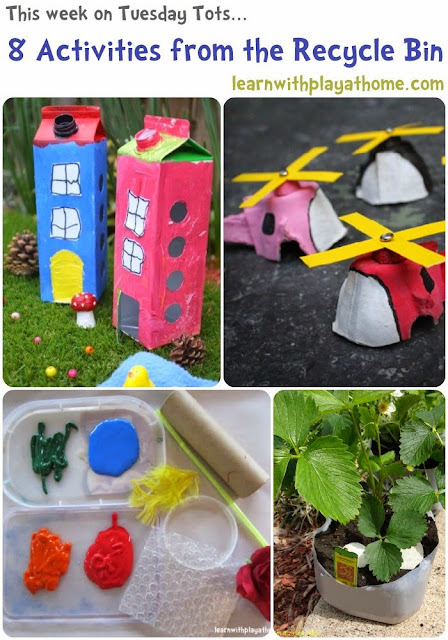 These fun activities centre around materials that have been pre-used. It's great to show children early on how we can look at reusing and re-purposing our waste to give it a new life and help keep us entertained and learning at the same time. 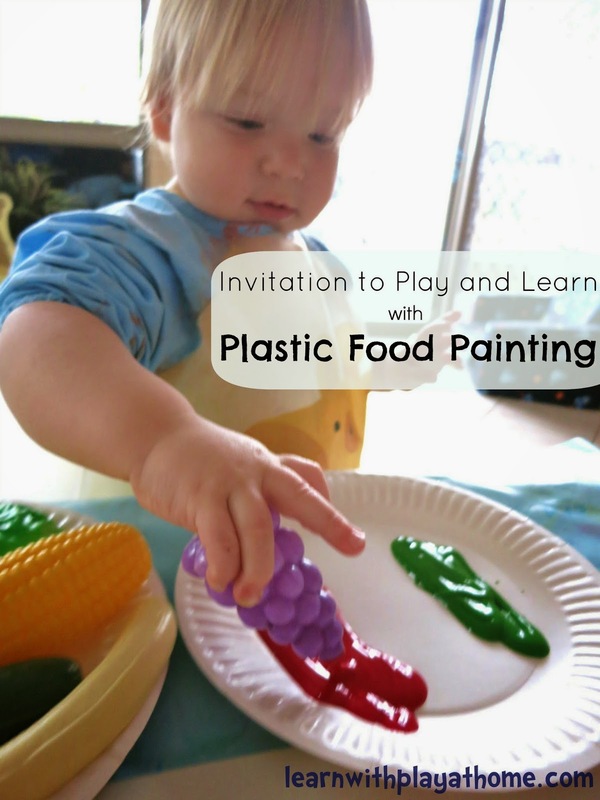 Play dough is a staple material for play at our house and as we use it very often, it's much more economical to make it ourselves then to buy it. 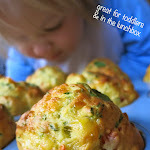 We have tried many, many different play dough recipes over the years but our favourite, and the one we always came back to was this no-cook recipe from the Imagination Tree. 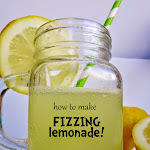 They have a secret ingredient they add for extra shine so be sure to check it out. 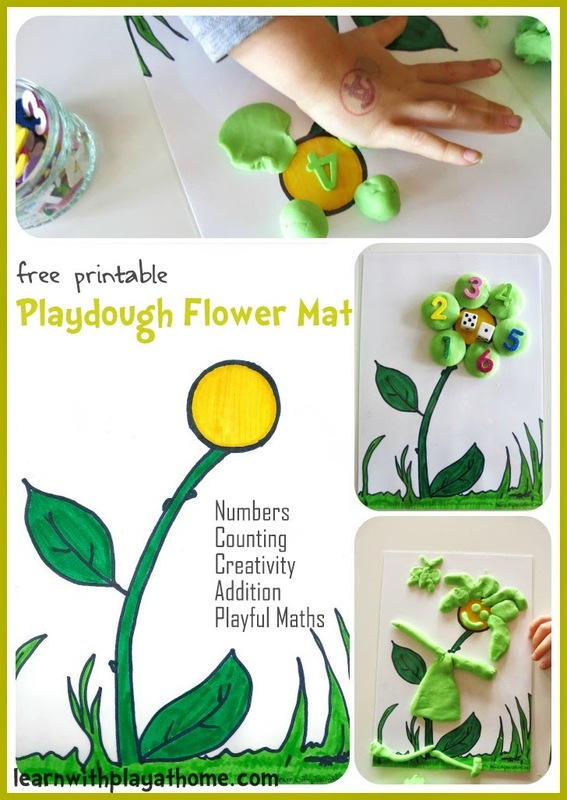 We've modified the method slightly over time to make it so super easy that the kids could make it with you. With playdough this soft, silky, quick and easy to make, you'll never need to buy playdough again. 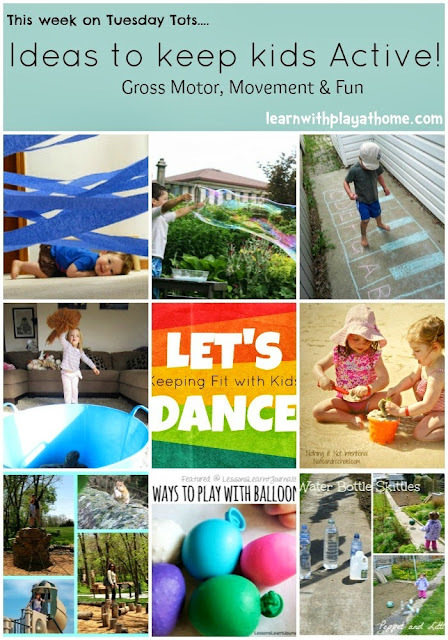 This week's link up contained a number of really fun and creative ideas for playing outside. While children will learn and be entertained by just getting out in nature, there are a number of great ideas to entice them outside and keep them busy for ages. 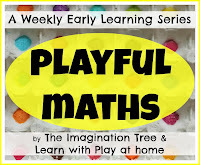 Last week I shared An Invitation to Play and Learn with Numbers and Nature. 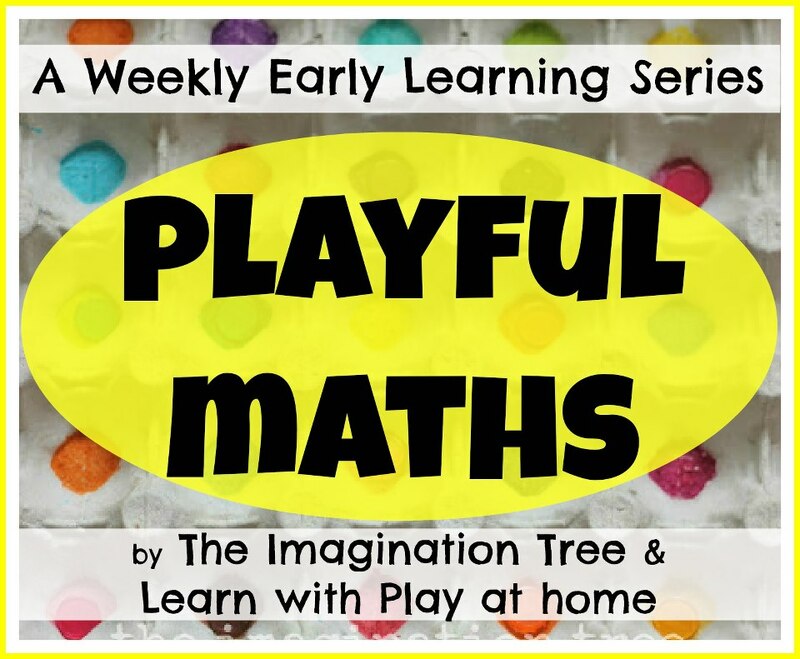 This week we bring you another 2 Playful Maths Activities using Natural Materials. In this activity we are focusing on counting and balancing. Other skills involved include fine motor, coordination, subitising, counting-on, ordering etc. 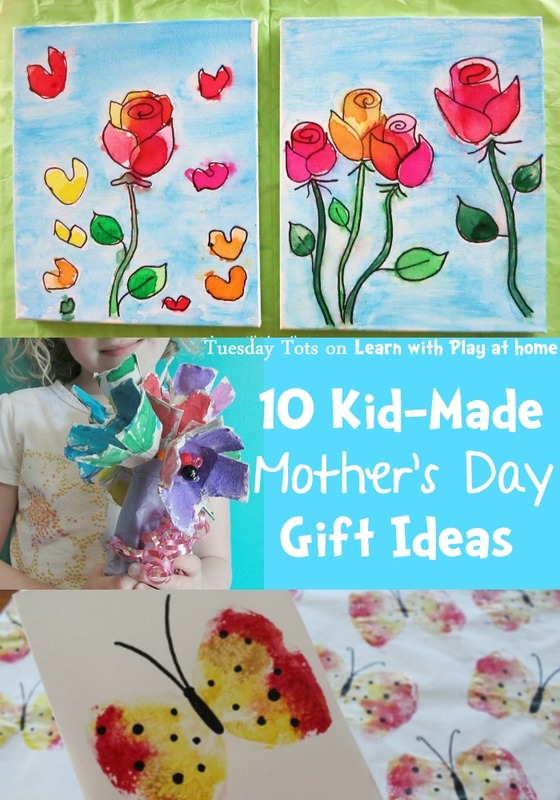 Hand-made gifts from kids can be hit and miss. Obviously the most important thing is that it's made with love but if it also happens to look fabulous and is useful, then it makes it even better. I love watching the anticipation on the faces of young children as they proudly hand over their handmade creations, just waiting for Mum to beam and declare her adoration for it. Here are a fun collection of activities/crafts for kids that will have them entertained and learning AND double as fabulous gifts as well. 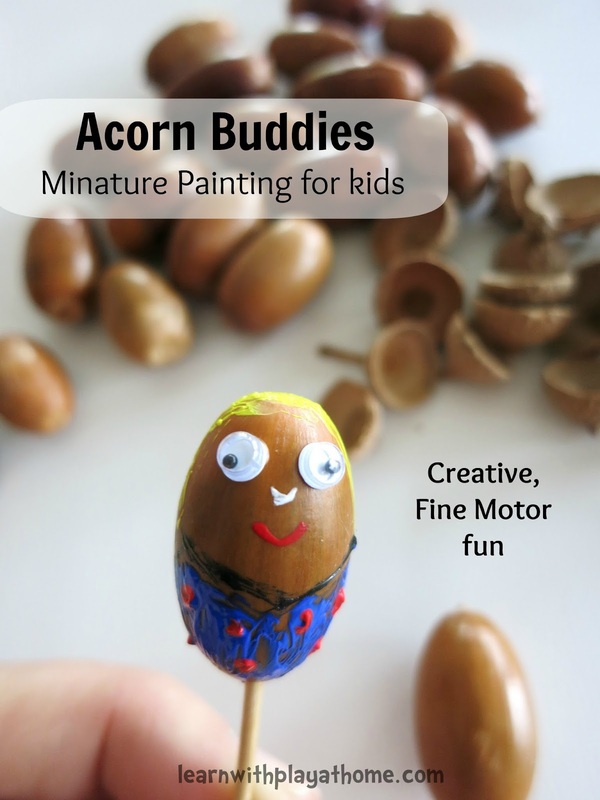 We've been exploring nature in various forms and today we decided to turn our acorns into little Acorn Buddies to use in pretend play and in a fun maths game. This creative activity had us painting in miniature and working on a different scale than we're used to. This required concentration, coordination and practiced our fine-motor skills. Following a death in the family, Maddie and I wanted to create something special in their memory as a gift. Instead of a bunch of flowers that would die we decided to paint some of their favourite flowers that would bloom forever instead. Creating Art together was a special bonding time and allowed us to talk about any thoughts or feelings.